The logistics were simple: I tied a small string around my wrist as a reminder. I told people around me. And I tried. 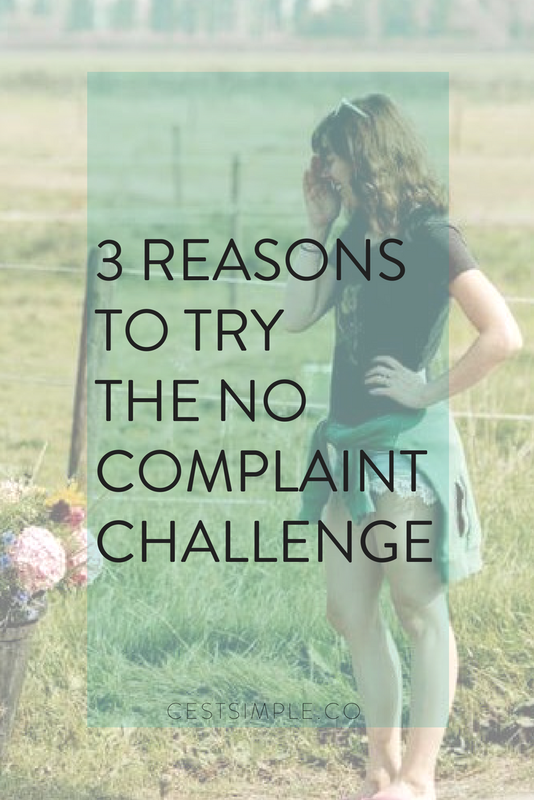 Different people have set up different rules around what counts as a 'complaint'. Some people also eliminate swearing and gossiping. My main rule was that it wasn't a complaint if I offered a solution for next time. In general I found it harder than other challenges as it wasn't something I could do, and cross of my list for the day. It was much less tangible and I'm sure some complaints happened without me even noticing. That doesn't mean it's not with trying, even just for a few days. When you start paying attention to when you complain, and what you complain about, you'll start to take note of what triggers you. It may be a person, the weather, or a situation you continuously run into. Then, dive into why you're reacting that way. Your complaining is your problem, not the trigger's problem. Your reaction to it is what makes it something worth complaining about. For example, if your husband doesn't cleans the dishes very well, it's actually not a problem. It only becomes one when you complain and make it one. One of the first things I heard from my coworker and friend was, great idea I'm going to try as well! Honestly if the only benefit from the exercise your or anyone else receives is more awareness to the fact that you or others complain, then it is a worthwhile experiment. When you mention you're trying not to complain to others, they will instantly think about their own complaints. You cannot stop complaining until you're aware that you're complaining. I started to get good at not complaining verbally. Then I quickly realized that I was complaining in my head. My thoughts and feelings were still as negative as they would have been had I complained out loud. Even though I wasn't spreading the negativity to others, it was still affecting my mood and mindset. You need to go deeper and start to address the origin of those thoughts, to stop them from popping up at all. You eliminate them by being in control of your mind, rather than letting in run rapid. This concept is really meditation 101, and what I believe is the only step you can take to start controlling the chaos of your thoughts & mind. Although not my most successful challenge to date, it's one I highly recommend you to try if you want to bring more positivity into your life.